A diet like the Oriental dietary pattern or the Mediterranean dietary pattern that has a high intake of fresh fruits and vegetables, fish and sea food, tomatoes, legumes and whole grains showed a decreased risk for progressing to AMD vision loss, whereas the Western dietary pattern of high intake of red meat, processed meat, high-fat dairy foods, fried potatoes, refined grains and flour and eggs that can lead to oxidative damage had an increased risk for contracting AMD. People who consumed green leafy vegetables and orange colored vegetables rich in carotenoids like carrots, yams, pumpkin squash and ate fatty fish like salmon had a beneficial lower risk for AMD. People who drank more than two alcoholic drinks a day had a higher risk for AMD. Diabetics with poorly managed control of their blood sugar levels were at high risk for AMD. People start to get a blurred spot in the center of their vision, which over time can get larger and they may also get blank spots in their central vision. In some people AMD progresses very slowly, while in others it can progress rapidly. Some people lose vision in only one eye, but some lose vision in both eyes. Also, things may not be seen as brightly as they should be. 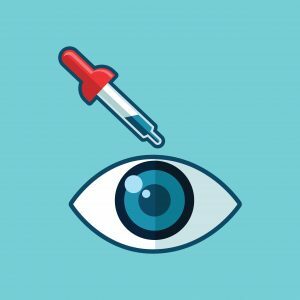 AMD does not lead to total blindness, but the loss of central vision has a bad impact on the quality of life with every day activities like reading, driving, writing, cooking, making household repairs, doing close work, watching TV programs or working on the computer. Get a yearly eye exam so things can be noticed early. Do not wait until you have lost your vision to see an eye doctor. Only an eye exam where the doctor puts in drops to dilate your pupils, so that he can see inside the eye can diagnose AMD. This dilated eye exam will allow the doctor to see drusen, which are yellow deposits underneath the retina. If he finds medium or large sized drusen then he will make the diagnosis of AMD. Medium sized drusen do not produce any kinds of symptoms, but are a sign of early AMD. At this point, making proper lifestyle changes and choices can determine the outcome. Changing your food habits may help, according to this research. Also, quitting smoking and drinking might help. Certainly worth a try to save your vision. If you or your aging loved one need short or long-term care then take a good look at the diet and cuisine offered at the residential facility. The Royal Suites Healthcare and Rehabilitation in Galloway Township, New Jersey has a chef who prepares nutritious, healthy meals and tailors them also to the needs of the residents. They have a restaurant on every floor and you or your loved one will feel like you are eating out and not feel like you are eating in an institutional kind of setting. Seniors should not neglect caring for their eyes. A yearly visit to a proper eye doctor for a dilated eye exam is necessary.